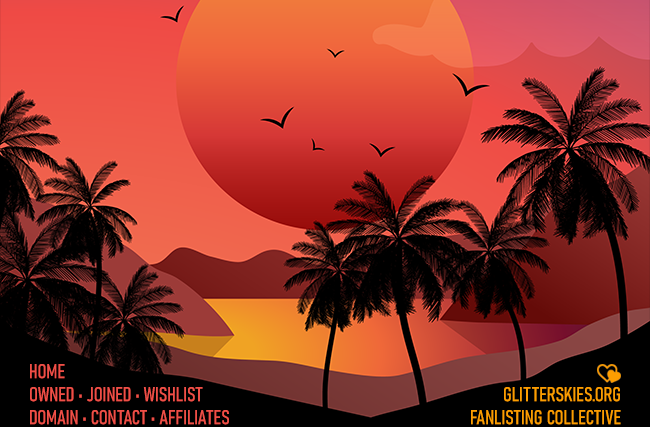 Welcome to Glitterskies.org, Nathalie's fanlisting collective! It has existed since 2005 as Limited-Eternity.net, Feudal-Fairytale.org, and finally Glitterskies.org from 2008 onwards. All fanlistings here are approved by either The Fanlistings Network or The Anime Fanlistings Network. We are currently housing 66 owned fanlistings with a total of 12913 members. You will also find links to 296 joined fanlistings and 56 affiliated collectives. If you have never heard of fanlistings before, you can head over to The Fanlistings Network and read the TFL 101.